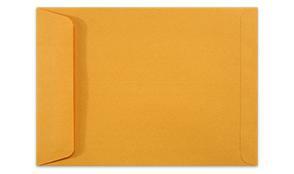 7 1/2 x 10 1/2 catalog envelopes in 28lb. brown kraft paper. The closure is a standard moisten to seal gum found on most envelopes. Latex "quick stick" or Peel & Stick can be added to make sealing easier. I am always a little hesitant to order printing on line from a company that I have never done business with, especially when I am ordering envelopes for my largest customer! I wanted to tell you what a fantastic job you did. The envelopes look great and my customer is very happy. Your customer service and art department support were great. And let's not forget your prices, they are great too. My customer saved thousands of dollars and you made me look like a hero!